With an intense sun ripened tomato flavor, both sweet and savory, married with tangy, briny olives and fruity extra virgin olive oil, this colorful spread adds a punch to any recipe. 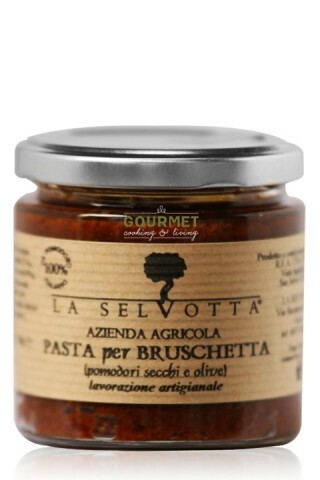 A versatile product, Pasta per Bruschetta can be used in appetizers, side dishes and entrees. As a starter, simply spread on thin sliced, toasted Italian bread. For an easy side dish, combine with white beans and garnish with fresh basil. For a hearty main dish, toss with your favorite pasta, a drizzle of extra virgin olive oil and a shaving of parmigiano reggiano cheese. Sundried tomatoes, olives, capers, extra virgin olive oil, basil, garlic, chili pepper, oregano, salt. Buy 2 for $13.25 each and save 6% . Buy 3 for $11.85 each and save 16% . Buy 6 for $11.15 each and save 21% . Founded in 1964 by Nicola Sputore, father of Giovanni and Elio, its current owners, the La Selvotta farm covers an area of about 75 acres in Vasto, in the region of Abruzzo, near the Adriatic Sea. It is a family owned business dedicated to the production of extra virgin olive oil, wine and fruit, distinguished amongst many others for its high quality. For three generations, the Sputore family has produced excellent extra virgin olive oil from varietals typical of the Vasto: Nebbio, Gentile di Chieti, Leccino, come from the olive groves of the hills of "Montevecchio and "Colle Pizzuto" and those younger from "Buonanotte" and "Selvotta" hills, all grown according to tradition and by the method of integrated control. All farming operations are performed by the owners. The precious oil is produced only from the healthiest olives, harvested by hand at the right time. The processing takes place at the company’s oil mill with millstones and cold extraction. The special treatment of the production stages, from the farming of olives to their grinding, is personally run by the company’s owners, guaranteeing an excellent outcome. The quest for quality has always been a priority for the company and is demonstrated by its numerous awards and presence in the best guides. Again this year, as for the last five, they were awarded: The “Three Leaves” by Gambero Rosso, the “Three Olives” by Slow Food, as well as being included in the guides “L’Extravergine” and “Flos Olei” by Marco Oreggia, Premio Nazionale “Ercole Oliario” in Spoleto, Premio Nazionale Oli di Oliva DOP “Sirena d’oro” in Sorrento, Concorso Internazionale "Mono Cultivar Olive Oil Expo 2010”, and Olio d’Oro 2010 award. In 2014, La Selvotta received the Gold Medal and in 2015 was awarded “Best in Class” at the NY International Olive Oil Competition for the Electum EVOO. Their continued effort year after year keeps them a small yet productive mill that stands out above the rest. The company offers the opportunity to get to know its olive oil and its production cycle through guided tours and short tasting courses. The company also offers preserves, D.O.C. and I.G.T. wines, and an exclusive farm-hotel experience. La Selvotta’s farm-hotel is surrounded by greenery and the sea. It offers the opportunity to spend a quiet and relaxing vacation in touch with nature, away from the fast pace and noise of the city. The sea is about 2/3 mile away and one can choose between the wide beach, the beautiful coves set into a cliff and the Punta Aderci marine reserve, or can visit the nearby Tremiti islands and the fun Acqualand water park. The mountains are also only a short distance away where is possible to visit the Abruzzo National Park and Majella National Park, or go back in time by visiting the Italic Temples in Schiavi d'Abruzzo or the Samnite Theater in Pietrabbondante.